Kettering, UK – Oct 10 2018 – Specialists in copyright, licensing and data protection, Naomi Korn Associates, and TownsWeb Archiving, digitisation, archiving and software specialist, have announced a new partnership: providing culture & heritage institutions with the confidence to tackle the challenges of copyright and data protection whilst digitising and publishing their collections. The partnership creates a combined offering that ensures that those who are planning a digitisation project can be provided with the required training and consultation to ensure their material complies with copyright and data protection policies. Combining expertise in this way makes it easier for clients to publish their digitised collections online, through systems such as TownsWeb Archiving’s PastView online access portal. Naomi Korn Associates are specialists in copyright, data protection and licensing, helping clients to manage their rights and privacy responsibilities. Using the practical, holistic approach, Naomi Korn Associates have developed over the last 15 years, they integrate legal, commercial, information governance and technical expertise, supporting long-term compliance and sustainability, through better organisational rights and privacy management. Naomi Korn Associates brings together a wide range of specialists with the expertise and skills to support cultural heritage organisations with their copyright and compliance responsibilities, such as data protection and the new GDPR, through providing training and development, rights clearance and consultancy services. 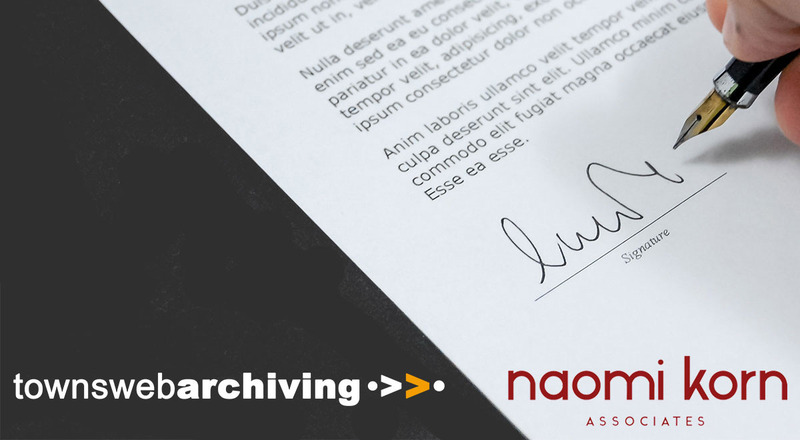 Naomi Korn Associates are delighted to be working with TWA to support organisations in understanding their legal compliance responsibilities so that they can digitise and provide access to their collections. TownsWeb Archiving Ltd specialises in providing digitisation services and software within the Heritage Sector. Working within public and private sector archives helping to convert old, precious, fragile and culturally significant items into digital formats. Our operators are fully trained/accredited in the handling of delicate and valuable items. A white gloves approach, utilisation of non-heat producing lighting and the use of specialists book rests, cradles and weights limit the risk of any damage to the original items. Our software development team can help archive owners provide innovative access to their image libraries via bespoke archive management software, virtual book turning software and also e-commerce online access allowing prints and images to be downloaded and ordered.